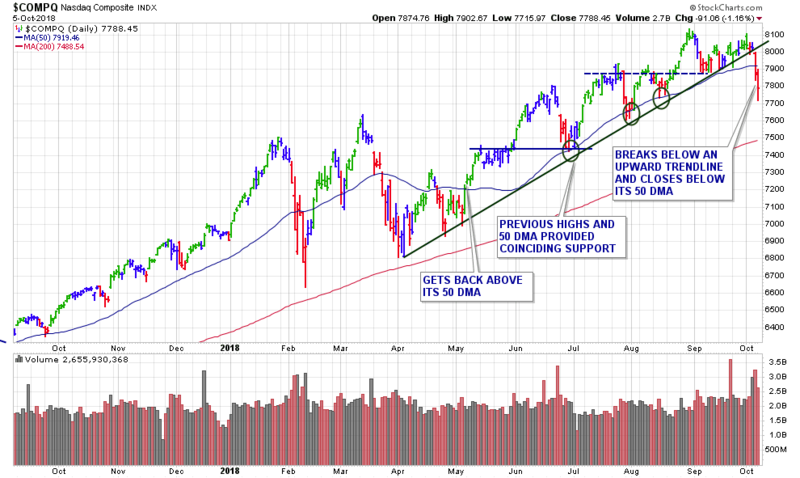 The major averages got hit with some rather severe selling in the later half of this past week as treasury yields jumped and worries about rising interest rates took their toll on the latest rally-run. Bond yields jumped to the highest level since 2011, and dampened investors’ optimism for equities, and especially tech stocks. The yield on 10-year shot to 3.24%, compared with 3.05% last week. The concerns overshadowed the September jobs report, which pointed to strength in the labor market as well as the broader economy. On Thursday, the Dow suffered its biggest one-day percentage drop since August, while both the S&P and the Nasdaq logged the biggest daily drop since late June. The market did pare its losses on Friday, yet still ended with its worst week since March. For the week, the S&P 500 lost -1% , the Dow closed basically flat, while the Nasdaq declined -3.2%. The composite broke below an upward trend line and closed below its 50-day moving average. The S&P 500 booked its second straight weekly decline. The benchmark’s chart fared better though as the index closed above its 50-day line after a brief dip below. The recent jump in bond yields was partly exacerbated on Wednesday by the Fed’s Reserve Chairman Jerome Powell who stated – “…we are a long way from neutral at this point.” The neutral rate refers to the point at which interest rates neither boost nor slow the economy, and many investors interpreted the comments as suggesting that the Fed may be eager to raise federal-funds rates more rapidly than had been previously expected. Many leading stocks which had already been struggling to say the least (and this includes our Sept. breakouts), continued to take damaging blows during Thursday and Friday’s sell off. On Monday, U.S. stock markets are open for trade, but the bond markets are closed in observance of Columbus Day. This could be a blessing and relieve some of the competing tensions, albeit possibly only short-term. We had 2 breakouts this past week. Please find my updated commentary on those selections below.